To further reinforce the botany theory, Gandarewa, in mythology, was also known as the 'Lord of Plants'. - the node is at 5pm in Churning Mists, and Gandarewa died here on Moogle just after 6pm. - the clue mentions a heretical sect. What else would a sect seek but Seventh Heaven, the highest of the heavens in Jewish mythology. - according to myth, Gandarewa guarded the White Haoma, a great healing plant that Gandarewa rarely gifted to those in need, and jealously guarded this plant at all times. - also the Seventh Heaven flower is white (White Haoma). Last edited by FlannTastic; 07-13-2015 at 04:29 AM. Leucrotta just spawned on Lich, at 8:28-8:31pm UK time (BST, possibly ST but maybe not since there's an issue with it) (not sure on exact time). Weather was clouds, no idea what spawned it. So here was Gandarewa's first pop on Siren. So it can also spawn with miner huh ? How unusual ! Thanks for sharing ! Got people to hit both miner nod, and botanist nod, negative thus far! i will keep trying with my groups! Did the guys from your servers have farmed FATEs when HW came out ? Because it sounds like Nunyunuwi actually, now that everyone's at lvl60, Senmurv isn't spawning a lot... but Gandarewa and Leucrotta are. 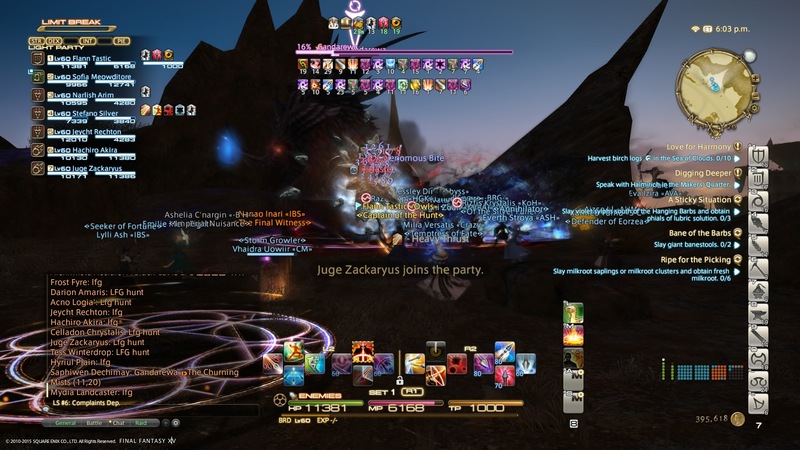 Gilgamesh had Senmurv spawn last night (Time of Death 7/12/2015 20:14 CDT.) FATES are just not a thing in HW areas on Gilg. I have to imagine it is something else. You can go anywhere you want in this world with a single blade. This may be a virtual world, but I feel more alive here than in the real world. Huh... my last hope just disappeared ;_; Can't think about what could spawn him. So frustrating ! Thanks for telling though xD I was planing to farm FATEs today so I guess I'll have to try something else !